“Mac” Gallegos was only 5 when his father, Army Sgt. Justin Gallegos, was killed in Afghanistan in 2009. Not a day goes by that he doesn’t think about him. On days like Jan. 24, his father’s 31st birthday, he gets a little help to honor his memory. “I wanted to write my dad a letter and get it as close to heaven as possible,” said Mac. Mac and his mother Amanda Marr discussed ways to get the letter to heaven but ultimately decided that having someone fly it in a jet airplane would be the best. “I posted on Facebook that we were looking for a pilot who could fly the letter for Mac,” said Marr. 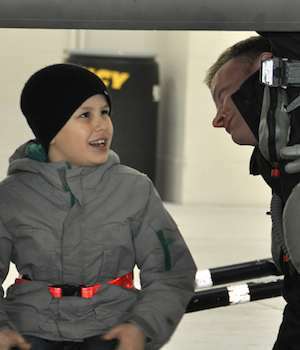 After a few emails and phone calls, Mac and his family were getting a tour of the F-22 Raptor and meeting its pilot, Lt. Col. Brian Baldwin assigned to the 302nd Fighter Squadron. The little boy handed over the letter he had written to his father on red construction paper, his dad’s favorite color. He watched as the plane took off and reached the clouds. Mac and his family have baked cupcakes waiting at home for a birthday ceremony on the ground.